It is just about time to play with knitting dolls! As you, visitors and fans of my blog, know there is quite a lot going on with knitted dolls in the prawelewe art studio, and it is due to my friend- Irishmagda, who designs her dolls for prawelewe and publishes them in my Seven Rainbows gallery. Some of the dolls have been already presented here: Forest Friends, Autumn Doll and Christmas Trio, and there are many more to come. Over the last couple of months we have received many questions about a possible Knit Along event focused on the dolls, and today I am thrilled to announce that finally all the materials and organisational matters have been polished and we are ready to begin the first doll KAL at prawelewe! The event will be held in my prawelewe group on Ravelry. Everyone is welcome! The instructions are provided in English so you need to be able to read at least basic patterns in this language. We will be happy to help you with some manor translations to Polish, though. Just join the group and let our members know that you would need language support. Irishmagda has designed a brand new doll exclusively for prawelewe and for this event. The doll is called Ballerina Girl and is one of the cutes creatures ever. 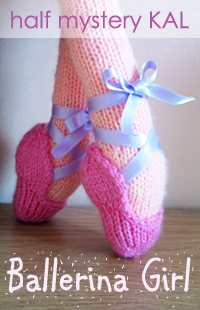 The Ballerina Girl KAL is a half mystery event because participants will know that they are going to knit a doll but they will not know how the doll looks like. During a four week period we are going to release one part of the pattern each week so participants will work on a particular section of the Ballerina Girl without knowing what comes next. Although I announce the event on all the prawelewe social media profiles, the Ballerina Girl KAL will be held only on Ravelry so for all the questions, tips, updates etc. please join us all there. Here is the Ballerina Girl half mystery KAL thread for all the start up conversation. We are going to have more threads dedicated to the KAL once it all begins. Join us, it is going to be great fun! This entry was posted in KALs & CALs, knitting. Bookmark the permalink. Nadzwyczaj pomocny , bezcenny materiał, szczególnie dla mniej zaawansowanych ,nie znających angielskiego dziewiarek. Bardzo , bardzo dziękuję za te słownik, doceniam bezinteresowność w dzieleniu się swoim doświadczeniem. Korzystam z tego słownika już od dawna, szkoda, że nie mogę sobie wydrukować. Przesyłam serdeczne pozdrowienia. Bardzo mi miło dostać tak cenny komentarz. Dziękuję. Od długiego czasu borykam się z myślami o prowadzeniu bloga też po polsku tak, jak robiłam to na początku, ale na razie koncentruję się na przygotowaniu materiałów do zaktualizowania strony w całości więc na wersję polską zapewne nie starczy czasu. Słownik też będę aktualizowała więc zapraszam do zaglądania.